Bridge crane in explosion - proof execution, bridge crane VBI, the crane explosion - proof, the VBI crane, the crane double - beam explosion - proof. Crane console and rotary (strut) loading capacity 6, 3t. , the departure of an arrow of 4 m, height of rise is 5 m, an angle of rotation of an arrow of 270 degrees, a way of application: for rise, transferring, removal, a freight raising. Cranes pavements clamshell can open as across and along the bridge, except the standard grab execution with the motor or hydraulic grab is also possible. Cranes pavements clamshell Pavement crane basic two - frame clamshell loading capacity 6, 3t. , flight of 12 m, height of rise is 8 m, the volume of the grab is 3 cubes, management from a cabin. Producer of LLC Plant of Krankomplekt. 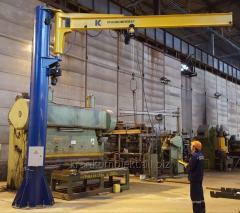 Cranes pavements magnetic with a loading capacity of 30 t. flight of 32 m height of rise is 16 m.
OOO NPP «Rost Elektromontazh» has issue gantry cranes CCS/c 12, 5T, 16t, 20T, 25t, 20/5T = 20. the crossing, 25, 32, flight consoles L1, L2 = up to 10 m. , a new sample in "picking for Europe": Gantry crane KKS - 12. 5; 16; 20; 20/5; 25. 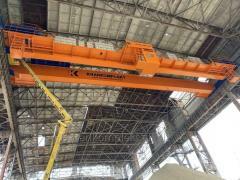 LLC NPP Krankomplekt adjusted release of the KKS goat cranes of / p 12, 5t, 16 t, 20 t, 25 t, 20/5t. Flight In = 20, 25, 32 m, a departure of L1, L2 consoles = to 10 m, a new sample in "The European complete set": Crane of goat KKC - 12, 5; 16; 20; 20/5; 25. Crane semi-goat / p 3,2t. Crane semi - goat kryukovy / p 3, 2t. , flight 4, 3m. , height of rise is 6 m.
Unbelievable price on Crane equipment in Zaporozhe (Ukraine) company Zavod Krankomplekt, OOO (Kranovyj Zavod). Wide choice of quality products at affordable prices.